This program is EXCELLENT for socializing. Only 1.5 hours of this program is spent in the theater. Come join us in the center of the Food Court at the Northgate Mall to meet a gang of friends, see a movie(or not) and grab dinner at the food court or bring a bag dinner. We encourage healthy meal choices. We will be there to help you pick a movie and get to it on time. This program has little to no supervision; you must be able to get your own dinner, to sit through a movie, leave, and meet your transportation without assistance. People choose different movies and it is arranged that no one has to go alone to a show unless they want to. Where: Northgate Food Court, at the tables in front of Subway, 7000 Northgate Mall, San Rafael. Please arrange to have your ride pick you up outside Food Court. NOTE: Northgate Mall construction may change meeting location - please call. Price: Prices are set by the theatres - approximately $8 for movies before 6pm and $11 after. 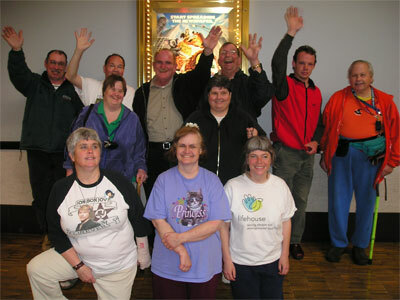 REC Inc clients meet friends at the Mall for snacks and a movie! REC Inc volunteers chaperone and help choose appropriate movies for clients to see as well as participate in the social gathering in the food court.